2. (CAE) Lab in the Department of Mechanical (Graduate Trainee) - First Class B.E / B.Tech in Mechanical or Production Engineering. Preference will be given to the candidates who have good exposure to Computer Aided Design software. 9. 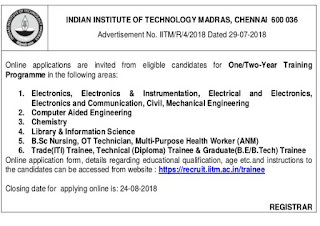 Central Workshop & Other Departments (Trade Trainee) - ITI holders in the field of Building Constructor/Mason ,Carpentry, Fitter, Machinist, Turner, Electrician, Mechanic, Diesel, Motor Mechanic Vehicle, Welder, Plastic Processing Operator, Sheet Metal Worker & Computer Operator & Programming Assistant (COPA),Foundry man, &Tool &Die Maker. 1. Only fresh Post Graduates who have passed out in 2017 or 2018 need to apply for GRADUATE TRAINING PROGRAMME - CENTRAL LIBRARY. 2. For Technical & Graduate Trainees in Central Workshop & Other Departments at Sl.No 1 & 2 , Candidates should have to register in BOAT Portal and apply with the Registration Number. 3. The apprenticeship training is one year for ITI, Diploma & B.E/B.Tech candidates in Central Workshop and other departments as per Apprenticeship Act and based on their performance, IIT Madras will engage them as Institute Trainees in the second year. 4. The period of training programme for Graduate Trainee – Chemistry is initially for a period one year extendable for a further period of one year subject to their satisfactory performance.